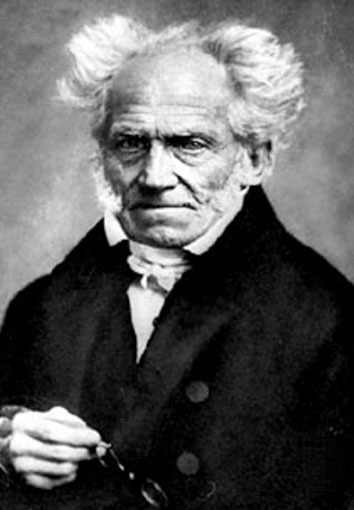 Arthur Schopenhauer has been supplying some of the best mental equipment for cricketers since 1814. Much of it was on show on Sunday 19th July 2009 at Lord’s where Third Man has taken his trusty Time Machine. For those who have not shared the journey There’s a chance to catch-up here . Andrew Strauss has declared England’s second innings closed at 311 for 6, setting Australia 522 runs to win. 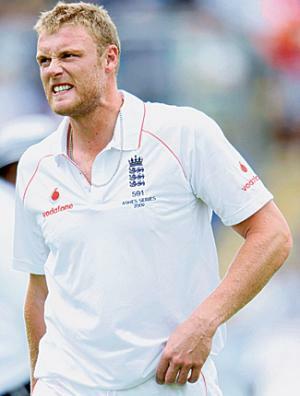 Andrew Flintoff – Team Talisman and Keeper of the Keys to Victory – has been the last man to emerge from the dressing room that morning, his aching wounds numbed by pain-killing injections, his mind reaching down to the very depths of his mental cricket bag, where among the stray sticking plasters, bits of used batting tape, old chewing gum packets, empty cans of Red Bull, discarded bat grips and tattered comics, great cricketers keep the special kit that marks them out from lesser players; deep desire, striving, wanting, effort and urging. Now, from the slips, Flintoff watches as Anderson bowls the first over of the day. Between deliveries he searches for the thing in itself. In the theatre of his mind he feels for his rhythm and finds a representation which will propel a pristine Duke nineteen yards towards the Australian openers. In only his second over, Flintoff draws Katich into a loose drive. The batsman’s feet sluggish from the wrong kind of adrenalin barely move. His bat at the extremity of control finds the ball a nano-second early. He has lost this skirmish for the point of contact and the Duke flies to the waiting Pietersen in the gully. Zeus, immediately, the Match Referee and two million viewers seconds later, see that Fintoff’s front foot has overstepped the line – but not Umpire Koertzen. 17 for 1. This brings Indomitable Ponting to the wicket with the inexperienced Hughes who, six overs later, edges a Flintoff delivery to the low-cupped hands of Strauss. Ponting yells to Hughes to stay his ground, challenging the England Captain, but Koertzen once more has made his decision. Zeus chuckles at the arbitrary world he has created for these foolish men as Strauss, surrounded by his jubilant team, picks a stray blade of grass from beneath his finger nail. The phenomenon is 34 for 2. Third Man is loitering in the Long Room after lunch, twiddling the end of the blue silk cord that the Australian captain has asked to be put up to keep his team safe from impassioned members of the MCC. It is therefore a fitting place from which to watch a livid Ponting return, bowled by Broad for 38 (78 for 3). A member offers his sympathy – Hard luck, Mr Ponting – to this passing Giant of the Game, who takes a further step or two and, without once looking back to his well-wisher, raises his super-short Kookaburra and clatters it against a glass cabinet appropriately full of previously donated bats. Swann dismisses Hussey and then bowls North with the one that ‘goes on’. But thanks to Michael Clarke and Brad Haddin Australia are 178 – 5 at tea. Third Man is at the bottom of the home side’s stairway when the earner rings. He watches a relaxed and buoyant England descend from their dressing room. As Strauss pushes the swing door that will take him into the Long Room another great roar goes up from within. Bringing up the rear again, Flintoff hears the cry, feeds off the energy from below, takes up the holler like some imitation of the Primordial Scream, and, from the landing, launches himself head first onto his unsuspecting team mates below like a surfer catching a reef break to be carried by them onwards into the foaming mass. But Clarke and Haddin have other ideas, other wills, other representations. Nor Swann, nor Collingwood, nor Broad, nor Anderson, nor even mighty Flintoff can part them, nor diminish their confidence, nor tame their aggression, nor stem the flow of runs. 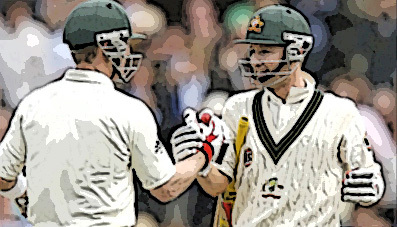 Haddin and Clarke - representation or the thing in itself? Time will tell. At 6.55 pm, with the two unbeaten on 125 and 80 in a partnership of 185, they leave the field, all England wondering whether tomorrow it is just possible that Australia can make the remaining 209 runs to win. Is cricket to be our most important cultural asset in this relatively new century? Are cricketers already our most important diplomats? While in Rome … do as the Greeks? The Greeks gave the early Italian tribes who would later become the Romans their alphabet, weights and measures, coinage, many of their gods and cults. The Romans saw in Hellenistic cities a comfortable, enjoyable lifestyle. Their houses acquired columns, statues, mosaics, tapestries and paintings on the walls. Even the eating of dinner while reclining came from the Greeks.Roman trade, banking, administration, art, literature, philosophy, earth science and sport bore the marks of Greek influence. For rich young Romans it was a must to have studied in Athens and to be able to speak Greek. America used Hollywood to colonize the world. They didn’t need to invade both to succeed economically and to dominate culturally. They sold the American dream first in the cinemas and then through the TV sets of the world. TM wishes the Chinese played cricket, but they don’t … yet. In fact they are busy trying to topple America by selling jeans to them and keeping the exchange rate low enough to destroy Western economies. Well, if it worked for the Americans against the Soviet Block it could well work again. Now as India stands on the verge of a bright future it is accepting the culture of Hollywood and transforming it into Bollywood; and the culture cricket and transforming it into Cricetainment. For this they need players – the best players from all over the globe including those from the UK. Our culture as expressed through the cricket and lifestyles of Flintoff, the English dimension to the Peiterson brand, Morgan, Bopara, and others will have their influence on how India progresses, what it values, how it acts, where it trades, what it buys and who it supports on the international stage as the century moves on. ONE: We need to properly value these relatively young men and for them to know and carry comfortably the responsibilities they hold and the opportunities they have to safeguard and develop the UK’s future. TWO: We need Government to recognize that for every pound they spend on diplomacy, embassies and foreign affairs initiatives another pound might be more effectively spent on promoting the enjoyment of the game and the emerging talent in this country. When Preston born Andrew Flintoff hangs up his three stripes, he could be our best choice for our next Ambassador to China.